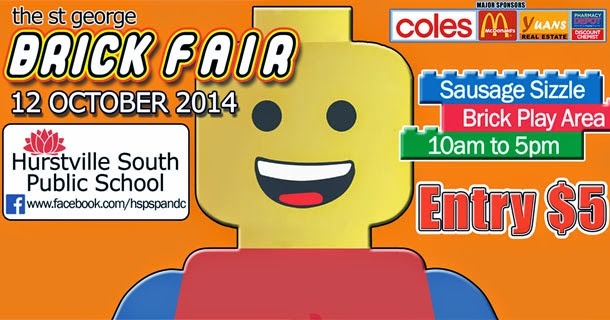 Hurstville South Public School is excited to be hosting the The St George Brick Fair 2014 on Sunday 12 October, 2014 between 10am to 5pm. The show will showcase amazing Lego creations from some of the best lego creators and builders in Australia. The St George Brick Fair will have on display over 1/2 million blocks built into displays that will excite both the young and... um... not so young. Along with the displays, there will be also a Brick Play area for those who are feeling inspired and creative after viewing the exhibitions. Entry is only $5 per person and all fund raised goes to the long overdue playground redevelopment project at the Hurstville South Public School. Even though the competition is aim at primary and high school kids, we welcome all submission and definitely encourage parents to help and assists their kids in the making of the video. Make sure your submission is in before 10pm 8 October, 2014 so that we have a chance to review all entries before the fair. Good Luck and have fun with your creation.